Handball at the 1980 Summer Olympics was represented by 2 events - a men's and a women's team competitions. They were held in two venues: in the Sokolniki Sports Palace (central part of Moscow) and in the Dynamo Sports Palace at Khimki-Khovrino (north-eastern part of Moscow). The schedule began on July 20 and ended on July 30. 100,493 spectators watched 51 matches of handball events at venues, mentioned above. 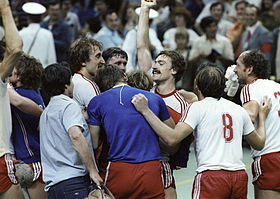 Soviet Union men's team celebrating their victory over Yugoslavia. RIAN photo. Soviet Union women's team during the victory ceremony. RIAN photo. 12 teams played each other in two groups to decide for which place each of them will compete in the final round. All matches were held on July 30. Each qualified country was allowed to enter one team of 14 players and they all were eligible for participation. Four nations competed in both tournaments. Remark:country names are not given in the form they were used in the official documents of the IOC in 1980.